This article is about the film. For other uses, see The Nightmare Before Christmas (disambiguation). 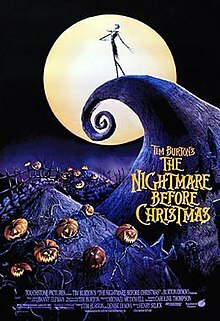 The Nightmare Before Christmas originated in a poem written by Burton in 1982 while he was working as an animator at Walt Disney Feature Animation. With the success of Vincent in the same year, Burton began to consider developing The Nightmare Before Christmas as either a short film or 30-minute television special to no avail. Over the years, Burton's thoughts regularly returned to the project, and in 1990, he made a development deal with Walt Disney Studios. Production started in July 1991 in San Francisco; Disney released the film through Touchstone Pictures because the studio believed the film would be "too dark and scary for kids". The film was met with both critical and financial success, grossing over $76 million during its initial run. It was nominated for the Academy Award for Best Visual Effects, a first for an animated film. The film has since been reissued by Walt Disney Pictures, and was re-released annually in Disney Digital 3-D from 2006 until 2009, making it the first stop-motion animated feature to be entirely converted to 3D. Halloween Town is a fantasy world filled with monsters, ghosts, ghouls, goblins, zombies, demons, mummies, vampires, werewolves, and witches. Jack Skellington, the "Pumpkin King" and leader of the town, leads them in organizing the annual Halloween celebrations. However, privately Jack has grown weary of the same routine year after year and wants something new. Wandering in the woods the morning after Halloween, he stumbles across seven trees containing doors leading to towns representing various holidays, and opens a portal to Christmas Town. Awed by the unfamiliar holiday, Jack returns to Halloween Town to show the residents his findings, but they fail to grasp the idea of Christmas and compare everything to their ideas of Halloween, although they do relate to one Christmas Town character; a red lobster-like king who flies at night named "Sandy Claws". Jack sequesters himself in his tower to study Christmas and find a way to rationally explain it, but cannot. He ultimately decides that it's unfair for Christmas Town alone to enjoy the holiday and announces that he and the citizens of Halloween Town will take over Christmas this year. Jack assigns the citizens of Halloween Town Christmas-themed jobs, including singing carols, making presents, and building a sleigh to be pulled by skeletal reindeer. Sally, a beautiful rag doll woman that is secretly in love with Jack, feels that their efforts will end in disaster, but Jack dismisses this and assigns her the task of sewing him a red coat to wear. He also tasks Lock, Shock and Barrel, a trio of mischievous trick-or-treating children, to abduct Santa Claus and bring him back to Halloween Town. Jack tells Santa he will be bringing Christmas to the world in his place this year. Jack orders the trio to keep Santa safe, but the children instead deliver Santa to Oogie Boogie, a gambling-addicted bogeyman, who plots to play a game with Santa's life at stake. Sally attempts to rescue Santa so he can stop Jack, but Oogie captures her as well. Jack departs to deliver presents to the world, but the Halloween-styled gifts terrify and attack the populace. As concerns over "Santa's" behavior grows, the military takes action and shoots down Jack, causing him to crash in a cemetery. As Jack bemoans the disaster he has made of Christmas, he finds he enjoyed the experience nonetheless, reigniting his love of Halloween. Jack returns to Halloween Town and finds Oogie's lair. Oogie tries to kill Jack, but Jack pulls apart the thread holding his cloth form together, revealing a massive pile of bugs that fall into Oogie's cauldron and are killed. Jack apologizes to Santa for his actions, and Santa assures Jack that he can fix things and returns to Christmas Town. As Santa replaces the Halloween-style presents with genuine ones, the townspeople of Halloween Town celebrate Jack's return. Santa then visits Halloween Town and brings them a snowfall for the residents to play with. In the graveyard, Jack and Sally declare their love for each other. Chris Sarandon, the speaking voice of Jack Skellington. Catherine O'Hara, the voice of Sally. Chris Sarandon (speaking voice) and Danny Elfman (singing voice) as Jack Skellington, a skeleton known as the "Pumpkin King" of Halloween Town. He owns a ghost dog named Zero, who has a small, glowing jack-o'-lantern nose. Elfman was initially cast as Jack's singing voice and, after the songs were recorded, Sarandon was cast to match Elfman's voice style. Elfman also voices Barrel, one of the trick-or-treaters working for Oogie Boogie. Elfman also voices the Clown with the Tear-Away Face, the self-described clown who rides a unicycle. Catherine O'Hara as Sally, a rag doll- scarecrow like creation of Finklestein, and the growing love interest of Jack. She is an amateur toxicologist that uses various types of poison to liberate herself from the captivity of Finklestein. She's also psychic and has premonitions when anything bad is about to happen. O'Hara had previously co-starred in Burton's Beetlejuice (1988). O'Hara also voices Shock, one of the trick-or-treaters working for Oogie Boogie. William Hickey as Doctor Finklestein, a mad scientist and the "father" of Sally. He is listed in the credits only as "Evil Scientist" and is only mentioned by name once in the film. Glenn Shadix as Mayor of Halloween Town, an enthusiastic leader who conducts town meetings. His wild mood swings from happy to distraught because his head spins between a "happy" and "sad" face; where some career politicians are figuratively two-faced, the Mayor is literally so. Burton and Shadix previously worked on Beetlejuice. Ken Page as Oogie Boogie, a villainous bogeyman in Halloween Town, who has a passion for gambling. Ed Ivory as Santa Claus, the leader of Christmas Town. Santa Claus is responsible for the annual celebration of Christmas, at which time he delivers presents to children around the world. Ivory also does the brief narration at the start of the film. Paul Reubens as Lock, one of the trick-or-treaters working for Oogie Boogie. Reubens and Burton previously worked on Pee-wee's Big Adventure (1985) and Batman Returns (1992). The cast also features Kerry Katz, Carmen Twillie, Randy Crenshaw, Debi Durst, Glenn Walters, Sherwood Ball, and Greg Proops voicing various characters. Patrick Stewart recorded narration for a prologue and epilogue. While not used in the final scene of the film, the narration is included on the soundtrack album. As writer Tim Burton's upbringing in Burbank, California was associated with the feeling of solitude, the filmmaker was largely fascinated by holidays during his childhood. "Anytime there was Christmas or Halloween, […] it was great. It gave you some sort of texture all of a sudden that wasn't there before", Burton would later recall. After completing his short film Vincent in 1982, Burton, who was then employed at Walt Disney Feature Animation, wrote a three-page poem titled The Nightmare Before Christmas, drawing inspiration from television specials of Rudolph the Red-Nosed Reindeer, How the Grinch Stole Christmas! and the poem A Visit from St. Nicholas. Burton intended to adapt the poem into a television special with the narration spoken by his favorite actor, Vincent Price, but also considered other options such as a children's book. He created concept art and storyboards for the project in collaboration with Rick Heinrichs, who also sculpted character models; Burton later showed his and Heinrichs' works-in-progress to Henry Selick, also a Disney animator at the time. After the success of Vincent in 1982, Disney started to consider developing The Nightmare Before Christmas as either a short film or 30-minute holiday television special. However, the project's development eventually stalled, as its tone seemed "too weird" to the company. As Disney was unable to "offer his nocturnal loners enough scope", Burton was fired from the studio in 1984, and went on to direct the commercially successful films, Beetlejuice and Batman. 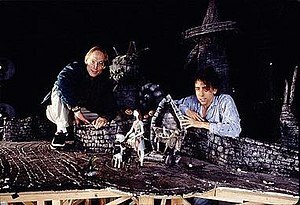 Director Henry Selick (left) and producer Tim Burton (right) on the Nightmare Before Christmas set. Over the years, Burton regularly thought about the project. In 1990, Burton found out that Disney still owned the film rights. He and Selick committed to produce a full-length film with the latter as director. Burton's own success in live-action films piqued the interest of Walt Disney Studios chairman Jeffrey Katzenberg, who saw the film as an opportunity of continuing the studio's streak of recent success in feature animation. Disney was looking forward to Nightmare "to show capabilities of technical and storytelling achievements that were present in Who Framed Roger Rabbit." Walt Disney Pictures president David Hoberman, believed the film would prove to be a creative achievement for Disney's image, elaborating "we can think outside the envelope. We can do different and unusual things." Nightmare marked Burton's third film in a row to have a Christmas setting. Burton could not direct because of his commitment to Batman Returns and he did not want to be involved with "the painstakingly slow process of stop motion". To adapt his poem into a screenplay, Burton approached Michael McDowell, his collaborator on Beetlejuice. McDowell and Burton experienced creative differences, which convinced Burton to make the film as a musical with lyrics and compositions by frequent collaborator Danny Elfman. Elfman and Burton created a rough storyline and two-thirds of the film's songs. Elfman found writing Nightmare's eleven songs as "one of the easiest jobs I've ever had. I had a lot in common with Jack Skellington." Caroline Thompson still had yet to be hired to write the screenplay. With Thompson's screenplay, Selick stated, "there are very few lines of dialogue that are Caroline's. She became busy on other films and we were constantly rewriting, re-configuring and developing the film visually." Selick and his team of animators began production in July 1991 in San Francisco, California with a crew of over 120 workers, utilizing 20 sound stages for filming. Joe Ranft was hired from Disney as a storyboard supervisor, while Eric Leighton was hired to supervise animation. At the peak of production, 20 individual stages were simultaneously being used for filming. In total, there were 109,440 frames taken for the film. The work of Ray Harryhausen, Ladislas Starevich, Edward Gorey, Étienne Delessert, Gahan Wilson, Charles Addams, Jan Lenica, Francis Bacon, and Wassily Kandinsky influenced the filmmakers. Selick described the production design as akin to a pop-up book. In addition, Selick stated, "When we reach Halloween Town, it's entirely German Expressionism. When Jack enters Christmas Town, it's an outrageous Dr. Seuss-esque setpiece. Finally, when Jack is delivering presents in the 'Real World', everything is plain, simple and perfectly aligned." Vincent Price, Don Ameche, and James Earl Jones were considered to provide the narration for the film's prologue; however, all proved difficult to cast, and the producers instead hired local voice artist, Ed Ivory. Patrick Stewart provided the prologue narration for the film's soundtrack. On the direction of the film, Selick reflected, "It's as though he [Burton] laid the egg, and I sat on it and hatched it. He wasn't involved in a hands-on way, but his hand is in it. It was my job to make it look like 'a Tim Burton film', which is not so different from my own films." When asked on Burton's involvement, Selick claimed, "I don't want to take away from Tim, but he was not in San Francisco when we made it. He came up five times over two years, and spent no more than eight or ten days in total." Walt Disney Feature Animation contributed with some use of second-layering traditional animation. Burton found production somewhat difficult because he was directing Batman Returns and in pre-production of Ed Wood. The filmmakers constructed 227 puppets to represent the characters in the movie, with Jack Skellington having "around four hundred heads", allowing the expression of every possible emotion. Sally's mouth movements "were animated through the replacement method. During the animation process, […] only Sally's face 'mask' was removed in order to preserve the order of her long, red hair. Sally had ten types of faces, each made with a series of eleven expressions (e.g. eyes open and closed, and various facial poses) and synchronized mouth movements." The stop motion figurine of Jack was reused in James and the Giant Peach (also directed by Selick) as Captain Jack. The film's soundtrack album was released in 1993 on Walt Disney Records. For the film's 2006 re-release in Disney Digital 3-D, a special edition of the soundtrack was released, featuring a bonus disc which contained covers of five of the film's songs by Fall Out Boy, Panic! at the Disco, Marilyn Manson, Fiona Apple, and She Wants Revenge. Four original demo tracks by Elfman were also included. On September 30, 2008, Disney released the cover album Nightmare Revisited, featuring artists such as Amy Lee, Flyleaf, Korn, Rise Against, Plain White T's, The All-American Rejects, and many more. American gothic rock band London After Midnight featured a cover of "Sally's Song" on their 1998 album Oddities. LiLi Roquelin did a French cover of "Sally's Song" which was released on her album Will you hate the rest of the world or will you renew your life? in 2010. Pentatonix released a cover of "Making Christmas" for their 2018 Christmas album Christmas Is Here!. Another soundtrack released in 2003 was the Disneyland Haunted Mansion Holiday CD. Although most were not original songs from the movie, one song provided on the CD is a medley of "Making Christmas", "What's This? ", and "Kidnap the Sandy Claws". Other songs included are original holiday songs changed to incorporate the theme of the movie. The last song on the list, however, is the soundtrack for the Disneyland Haunted Mansion Holiday ride. Disney decided to release the film under its adult film label Touchstone Pictures because they thought the film would be "too dark and scary for kids", Selick remembered. "Their biggest fear, and why it was kind of a stepchild project, [was] they were afraid of their core audience hating the film and not coming." To convey Burton's involvement and attract a wider audience, Disney marketed the film as Tim Burton's The Nightmare Before Christmas. Burton explained that,"…it turned more into more of a brand-name thing, it turned into something else, which I'm not quite sure about." The film premiered at the New York Film Festival on October 9, and was given a limited release on October 15, 1993, before its wide theatrical release on October 22. The Nightmare Before Christmas was reissued under the Walt Disney Pictures label and re-released on October 20, 2006, with conversion to Disney Digital 3-D. Industrial Light & Magic assisted in the process. The film subsequently received re-releases in October 2007 and 2008. The El Capitan Theatre in Hollywood, California has been showing the film in 4-D screenings annually in October, ending on Halloween, since 2010. The reissues have led to a reemergence of 3-D films and advances in RealD Cinema. With years of successful home video sales, Nightmare later achieved the ranks of a cult film. Touchstone Home Video first released the film on VHS on September 30, 1994, and on DVD on December 2, 1997. The DVD release contained no special features. Nightmare was released a second time on October 3, 2000 as a special edition. The release included an audio commentary by Selick and cinematographer Pete Kozachik, a 28-minute making-of documentary, a gallery of concept art, storyboards, test footage and deleted scenes. Burton's Vincent and Frankenweenie were also included. Both DVDs were non-anamorphic widescreen releases. Walt Disney Studios Home Entertainment released the film on DVD again (this time with an anamorphic transfer) and on Blu-ray Disc (for the first time) on August 26, 2008 as a two-disc digitally remastered "collector's edition", but still containing the same special features. Walt Disney Studios Home Entertainment released The Nightmare Before Christmas on Blu-ray 3D on August 30, 2011. The release included a Blu-ray 3D disc, Blu-ray Disc and a DVD that includes both a DVD and digital copy of the film. In 2018, Walt Disney Studios Home Entertainment issued a sing along version of the film in addition to the theatrical cut of the film as well as a Movies Anywhere copy of the film as a single disc version for its 25th anniversary. Disney has undertaken an extensive marketing campaign of these characters across many media. Since 2001, Disneyland has held a seasonal Nightmare Before Christmas theme for its Haunted Mansion Holiday attraction. The attraction, an overlay of the park's Haunted Mansion, features characters, decorations and music from the film. In addition to Mickey's Not-So-Scary Halloween Party and Mickey's Halloween Party featuring the film's characters, Jack Skellington, Sally, Pajama Jack, and the Mayor have been made into Bendies figures, while Jack and Sally even appear in fine art. Moreover, Sally has been made into an action figure and a Halloween costume. A Jack Skellington figurine is available for the Disney Infinity video game, allowing the character to be playable in the game's "Toy Box Mode". Jack is also the titular character in the short story "Tim Burton's The Nightmare Before Christmas: Jack's Story", and also appeared in HalloWishes and Halloween Screams fireworks at Magic Kingdom (where the host is Ghost Host) and Disneyland (where the host is Jack himself). Nightmare has inspired video game spin-offs, including Oogie's Revenge and The Pumpkin King, and is among the many Disney-owned franchises that contribute to the mythology of the Kingdom Hearts series. A trading card game is also available. Around the release of the film, Disney executive David Hoberman was quoted, "I hope Nightmare goes out and makes a fortune. If it does, great. If it doesn't, that doesn't negate the validity of the process. The budget was less than any Disney blockbuster so it doesn't have to earn Aladdin-sized grosses to satisfy us." The film earned $50 million in the United States on its first theatrical run and was regarded as a moderate "sleeper hit". The Nightmare Before Christmas made a further $8.7 million in box office gross in its 2006 reissue. The 2007 and 2008 reissues earned $14.5 million and $1.1 million, respectively, increasing the film's total box office gross to $75 million. The film initially received positive reviews from critics; it has since gone on to receive widespread critical acclaim. On Rotten Tomatoes, the film holds a rating of 95%, based on 94 reviews, with an average rating of 8.25/10. The site's consensus reads, "The Nightmare Before Christmas is a stunningly original and visually delightful work of stop-motion animation." On Metacritic the film has a score of 82 out of 100, based on 30 critics, indicating "universal acclaim". Roger Ebert gave a highly positive review for Nightmare. Ebert believed the film's visual effects were as revolutionary as Star Wars, taking into account that Nightmare was "filled with imagination that carries us into a new world". Peter Travers of Rolling Stone called it a restoration of "originality and daring to the Halloween genre. This dazzling mix of fun and fright also explodes the notion that animation is kid stuff. … It's 74 minutes of timeless movie magic." James Berardinelli stated "The Nightmare Before Christmas has something to offer just about everyone. For the kids, it's a fantasy celebrating two holidays. For the adults, it's an opportunity to experience some light entertainment while marveling at how adept Hollywood has become at these techniques. There are songs, laughs, and a little romance. In short, The Nightmare Before Christmas does what it intends to: entertain." Desson Thomson of The Washington Post enjoyed stylistic features in common with Oscar Wilde, German Expressionism, the Brothers Grimm and The Cabinet of Dr. Caligari. Michael A. Morrison discusses the influence of Dr. Seuss' How the Grinch Stole Christmas! on the film, writing that Jack parallels the Grinch and Zero parallels Max, the Grinch's dog. Philip Nel writes that the film "challenges the wisdom of adults through its trickster characters", contrasting Jack as a "good trickster" with Oogie Boogie, whom he also compares with Dr. Seuss' Dr. Terwilliker as a bad trickster. Entertainment Weekly reports that fan reception of these characters borders on obsession, profiling Laurie and Myk Rudnick, a couple whose "degree of obsession with [the] film is so great that … they named their son after the real-life person that a character in the film is based on." This enthusiasm for the characters has also been profiled as having spread beyond North America to Japan. Yvonne Tasker notes "the complex characterization seen in The Nightmare Before Christmas". Danny Elfman was worried the characterization of Oogie Boogie would be considered racist by the National Association for the Advancement of Colored People (NAACP). Elfman's predictions came true; however, director Henry Selick stated the character was inspired by the Betty Boop cartoon The Old Man of the Mountain. "Cab Calloway would dance his inimitable jazz dance and sing 'Minnie the Moocher' or 'Old Man of the Mountain', and they would rotoscope him, trace him, turn him into a cartoon character, often transforming him into an animal, like a walrus," Selick continued. "I think those are some of the most inventive moments in cartoon history, in no way racist, even though he was sometimes a villain. We went with Ken Page, who is a black singer, and he had no problem with it". The film was nominated for both the Academy Award for Best Visual Effects and the Hugo Award for Best Dramatic Presentation. Nightmare won the Saturn Award for Best Fantasy Film, while Elfman won Best Music. Selick and the animators were also nominated for their work. Elfman was nominated for the Golden Globe Award for Best Original Score. Most recently, the film ranked #1 on Rotten Tomatoes' "Top 25 Best Christmas Movies" list. In 2001, Disney began to consider producing a sequel, but rather than using stop motion, Disney wanted to use computer animation. Burton convinced Disney to drop the idea. "I was always very protective of Nightmare not to do sequels or things of that kind," Burton explained. "You know, 'Jack visits Thanksgiving world' or other kinds of things just because I felt the movie had a purity to it and the people that like it… Because it's a mass-market kind of thing, it was important to kind of keep that purity of it." The 2004 video game The Nightmare Before Christmas: Oogie's Revenge did serve as a sequel of the film, with Capcom's crew of developers going after Burton for advice, and having the collaboration of the film's art director, Deane Taylor. In 2009, Selick said he would do a film sequel if he and Burton could create a good story for it. In February 2019, it was reported that a new Nightmare Before Christmas film was in the works, with Disney considering either a stop-motion sequel or live-action remake. A collectible card game based on the film called The Nightmare Before Christmas TCG was released in 2005 by NECA. The game was designed by Quixotic Games founder Andrew Parks and Kez Shlasnger. It consists of a Premiere set and 4 Starter Decks based on four characters, Jack Skellington, the Mayor, Oogie Boogie, and Doctor Finklestein. Each Starter Deck contains a rule book, a Pumpkin King card, a Pumpkin Points card, and a 48-card deck. The game has four card types: Characters, Locales, Creations, and Surprises. The Cards' rarities are separated into four categories: Common, Uncommon, Rare, Ultra Rare. Quixotic Games also developed The Nightmare Before Christmas Party Game that was released in 2007 by NECA. A collector's edition The Nightmare Before Christmas-themed Jenga game was issued with orange, purple and black blocks with Jack Skellington heads on them. The set comes in a coffin-shaped box instead of the normal rectangular box. A 168-card Munchkin Tim Burton's The Nightmare Before Christmas-themed Munchkin was developed by USAopoly featuring the citizens of Halloween Town such as Jack Skellington, Oogie Boogie, Doctor Finklestein, and Lock, Shock and Barrel. The game comes with a custom die similar to the ones used by Oogie Boogie in the film. A live concert, produced by Disney Concerts, was held at the Hollywood Bowl in October 2015, and was followed by subsequent performances in 2016 and 2018. The shows featured Elfman, O'Hara, and Page reprising their roles from the film. ^ The Nightmare Before Christmas was reissued as a Walt Disney Pictures release in 2006. ^ "The Nightmare Before Christmas (PG)". British Board of Film Classification. March 18, 1994. Retrieved December 7, 2016. ^ a b c d e Mark Salisbury, Tim Burton (2006). Burton on Burton. London: Faber and Faber. pp. 121–127. ISBN 0-571-22926-3. ^ a b "Tim Burton's The Nightmare Before Christmas (1993)". Box Office Mojo. Retrieved September 28, 2014. ^ a b c d Mendelson, Scott (October 15, 2013). "'Nightmare Before Christmas' Turns 20: From Shameful Spawn To Disney's Pride". Forbes. Retrieved December 14, 2013. ^ a b Stern, Marlow (October 29, 2013). "Henry Selick on Directing 'The Nightmare Before Christmas'". The Daily Beast. Retrieved September 25, 2016. ^ Lammers, Tim (October 29, 2013). "Sarandon remains proud of 'Nightmare Before Christmas' as film classic turns 20". Strictly Cinema. Retrieved September 25, 2016. ^ a b Simpson, Blaise (October 10, 1993). "The Concept: Jack-o'-Santa : Tim Burton's new movie for Disney isn't exactly a steal-Christmas-kind-of-thing. It's more like a borrow-it-and-give-it-a-weird-twist-kind-of-thing". Los Angeles Times. pp. 1–4. ^ a b Carr, Jay (October 17, 1993). "Tim Burton's Big Adventure". The Boston Globe. ^ Thompson, Frank T. (October 14, 1993). Tim Burton's The Nightmare Before Christmas: The Film, The Art, The Vision. p. 8. ISBN 9780786880669. OCLC 28294626. ^ a b c d e Avins, Mimi (November 1993). "Ghoul World". Premiere: pp. 24–30. Retrieved on September 26, 2008. ^ Topel, Fred (August 25, 2008). "Director Henry Selick Interview – The Nightmare Before Christmas". About.com. Retrieved May 27, 2012. ^ a b Broeske, Pat H. (January 20, 1991). "Dusting Off Burton". Los Angeles Times. Retrieved May 26, 2012. ^ Simpson, Blaise (October 10, 1993). "The Concept: Jack-o'-Santa : Tim Burton's new movie for Disney isn't exactly a steal-Christmas-kind-of-thing. It's more like a borrow-it-and-give-it-a-weird-twist-kind-of-thing". Los Angeles Times. Retrieved September 25, 2016. ^ a b c Korkis, Jim (September 5, 2018). "The Making of Tim Burton's The Nightmare Before Christmas - Part One". Mouse Planet.com. Retrieved September 5, 2018. ^ "BV toons up down under". Variety. February 18, 1993. Retrieved September 26, 2008. ^ a b c d e David Helpern (December 1994). "Animated Dreams", Sight & Sound, pp. 33—37. Retrieved on September 26, 2008. ^ Jones, Bill (October 22, 1993). "He Kept His Nightmare Alive". The Phoenix Gazette. ^ a b c Scott Collura (October 20, 2006). "The Nightmare Before Christmas 3-D: 13 Years and Three Dimensions Later". IGN. Retrieved September 27, 2008. ^ "Nightmare: Truly the Stuff of Dreams". Electronic Gaming Monthly (53). EGM Media, LLC. December 1993. p. 357. ^ James Montgomery (August 28, 2006). "Fall Out Boy, Panic, Marilyn Manson Add To New 'Nightmare Before Christmas' Soundtrack". MTV News. Retrieved November 29, 2008. ^ Scott Collura (October 20, 2006). "The Nightmare Before Christmas 3-D: 13 Years and Three Dimensions Later". IGN. Retrieved September 2, 2012. ^ John Evan Prook (August 18, 1993). "Christmas comes to N.Y. Film Fest". Variety. Retrieved September 26, 2008. ^ "Tim Burton's 'The Nightmare Before Christmas' To Use 4D in Special Event". Geeksofdoom.com. Retrieved October 14, 2010. ^ Cam Shea (April 27, 2007). "Real D: The Future of Cinema". IGN. Retrieved September 26, 2008. ^ a b Shawn Adler; Larry Carroll (October 20, 2006). "How Burton's Fever Dream Spawned Nightmare Before Christmas". MTV. Retrieved September 27, 2008. ^ "The Nightmare Before Christmas (1993)". Amazon.com. Retrieved September 26, 2008. ^ "The Nightmare Before Christmas (Special Edition)". Amazon.com. Retrieved September 26, 2008. ^ "The Nightmare Before Christmas (2-Disc Collector's Edition + Digital Copy)". Amazon.com. Retrieved September 26, 2008. ^ "The Nightmare Before Christmas [Blu-ray] + Digital Copy (1993)". Amazon.com. Retrieved October 15, 2008. ^ "'The Nightmare Before Christmas - 3D' Dated and Detailed for Blu-ray 3D!". highdefdigest.com. ^ Ramin Setoodeh, "Haunted Parks", Newsweek 144.16 (October 18, 2004): 73. ^ "New Disney Fine Art: Tim Burton’s Nightmare Before Christmas Limited Edition by Artist Jim Salvati," TechWhack (November 3, 2008). ^ For an image of a Sally costume, see Bobwilson, "Halloween gives teens a chance to scare, be silly Archived July 14, 2011, at the Wayback Machine," Lubbock Avalanche-Journal (October 31, 2008). ^ "Disney Infinity: Jack Skellington". Disney. Archived from the original on January 6, 2017. Retrieved October 11, 2018. ^ "Tim Burton's The Nightmare Before Christmas in 3-D (2006)". Box Office Mojo. Retrieved September 26, 2008. ^ "The Nightmare Before Christmas (1993)". Rotten Tomatoes. Fandango Media. Retrieved October 13, 2014. ^ "The Nightmare Before Christmas Reviews". Metacritic. CBS Interactive. Retrieved April 13, 2018. ^ Ebert, Roger (October 22, 1993). "The Nightmare Before Christmas". RogerEbert.com. Retrieved September 26, 2008. ^ Peter Travers (April 11, 2001). "The Nightmare Before Christmas". Rolling Stone. Retrieved September 26, 2008. ^ James Berardinelli. "The Nightmare Before Christmas". ReelViews. Retrieved September 26, 2008. ^ Desson Thomson (October 22, 1993). "The Nightmare Before Christmas". The Washington Post. Retrieved September 26, 2008. ^ "Obsessive Fans of the Week!" in Entertainment Weekly 909 (12/1/2006): 6. ^ Ken Hanke (1999). "Burtonland". Tim Burton: An Unauthorized Biography of the Filmmaker. Renaissance Books. pp. 137–148. ISBN 1-58063-162-2. ^ "The Nightmare Before Christmas (1993): Rank 1". Rotten Tomatoes. Retrieved December 20, 2008. ^ "CYNAMATIC: EXCLUSIVE: Masato Yoshino Gets Oogie's Revenge". MovieWeb. October 7, 2005. Retrieved January 6, 2011. ^ "Tim Burton's The Nightmare Before Christmas: Oogie's Revenge – Deane Taylor Interview". TeamXbox. September 19, 2005. Archived from the original on July 16, 2011. Retrieved January 6, 2011. ^ Otto, Jack (February 1, 2009). "How possible is a sequel to Nightmare Before Christmas?". Blastr. Retrieved January 6, 2011. ^ Lowery, Mike. "Exclusive : Talks underway for Nightmare Before Christmas follow-up". Moviehole. Moviehole. Retrieved 10 February 2019. ^ "Quixotic Games - About Quixotic". quixoticgames.com. Retrieved April 27, 2016. ^ "Quixotic Games - Ludography". quixoticgames.com. Retrieved April 27, 2016. ^ "Nightmare Before Christmas Jenga". craziestgadgets.com. ^ "Munchkin® The Nightmare Before Christmas". worldofmunchkin.com. Retrieved April 27, 2016. ^ "MUNCHKIN: Tim Burton's The Nightmare Before Christmas". usaopoly.com. Retrieved April 27, 2016. ^ Kit, Borys (September 4, 2018). "'The Nightmare Before Christmas' Getting 25th Anniversary Concert at Hollywood Bowl". The Hollywood Reporter. Retrieved September 6, 2018. Frank Thompson (July 2002). Tim Burton's The Nightmare Before Christmas: The Film, the Art and the Vision (Paperback). Hyperion. ISBN 978-0-7868-5378-6. Jun Asaga (July 2002). Tim Burton's The Nightmare Before Christmas (Paperback). Disney Press. ISBN 978-0-7868-3849-3. Manga adaptation of the film. Wikimedia Commons has media related to The Nightmare Before Christmas. John Scalzi (August 28, 2008). "Why Tim Burton's Recurring Nightmare Remains So Popular". AMC. Archived from the original on September 12, 2008. Nightmare Before Christmas Behind The Scenes A time lapse of the stop-motion animation process.